The world is bathed in moonlight; this night is almost as bright as day. The breeze wafts in the sound of the flute being played, somewhere far away. A young woman stands in the meadows, peering into the distance, seeking her love, the flautist. Her mind is awash with misery and longing, as restless as the waves of the ocean. At times, she is stilled by the music, for it is enchanting, this music that the flute player plays. At times, her overwhelming love makes her wait unbearable. ‘Won’t you come and embrace me in a lonely grove and make me flower with sensations?’ she begs in her mind. At other times, her attachment makes her full of jealousy and doubt ‘While I cry out for you in despair, are you frolicking with other women? Is this just? Is this fair?’. Her heart lurches from one thing to another as she awaits her lover. And like the ebb and flow of the waves, her heart too ebbs and flows with love, longing and despair. What an evocative image the poet-composer Oothukadu Venkata Subbaiyer (c. 1700-1765) has painted!! Oh the poignant grief of separation from one who is loved so very much! I have previously written a post on viraha bhava, which features often in Indian literature and music. Alai Payude Kanna, a well-known and well-loved kriti, is a superb example of this mood. The poet writes of Radha’s wait for Krishna, but he also writes of the Bhaktas’ longing for union with the divine. Like the flautist who enchants and stills her, so too are we enchanted into the stillness of meditation and contemplation at times. As she begs for union, so too do we beg for Moksha, a release from this cycle of birth and death and union with the divine. As she despairs with jealousy and lack of faith, so too do we let doubts fill our mind causing our own grief. And always, like the restless waves of the ocean, our mind surges, forever seeking the Lord. Set to Raga Kanada, a sad raga, the composer mimics the ebb and flow of the waves by the rise and fall of the melody. From a longing in the lower octaves, to a despairing cry for justice in the higher octaves, the speed changing to match the mood, and then back down the scales to a gentle sadness – it is very cleverly composed. When you listen, note the beautiful usage of the sounds of the words to show the urgency in the madhyamakala sangati. In the staccato sounds of ‘kaditta manattil urutti padattai’ , the alliteration of the ‘tt’ sound adds to the effect. To know more about the raga, click here. Today I present Sudha Raghunathan’s version from her album Alaipayuthey Kanna which I bought in the early nineties as a casette tape. Formats have changed over the years but the music still remains very pleasing. Mandolin Maestro U.Shrinivas is a musician whom I admire tremendously. Here is his excellent rendition of this kriti. இது தகுமோ, இது முறையோ, இது தருமம் தானோ? idu tagumO! idu muraiyO! idu darumam dAnO! My mind (en manam) is as restless as the waves (alai) in an ocean as I listen to the happy (ananda), bewitching (mohana) sound of the flute (venu) you play. I stand transfixed (nilai = place, peyarAdu = without moving) like a statue (silai pOlavE), unaware (ariyAmalE) of even of the passage of time (nEramAvadu), oh my mysterious (vinOdamAna) flautist (muralIdhara) ! The moon (nilavu) is clear (telinda) and shines (eriyudE) as bright as the day (pattap-pagal). I seek you (implied in dikkai=direction nokki=looking), my brows (iru=two, puruvam=brows) drawn (neriyudE). The breeze (kAtru) brings in the sound of your mellow (kaninda) flute music (vEnu gAnam) and my eyes (kaNgal) close involuntarily (sorugi) in ecstasy (implied in oru vidamAi= in a certain manner). Come, bless me (enakkau alittu=by giving me) with your feet (padam) and melt (urutti) my heavy (kaditta) heart (implied in manam=mind), filling me with happiness (magaizhtta)! Come (va), embrace (anaikka) me in a lonely (tanitta) grove (vanam) and make me flower (mugiztta) with sensations (uNarchchi)! Come (Va) to the waves (alai) of the roaring (kanai=sound making) ocean (kadal) and give (aLittha) me your two (iru) feet (kazhal) which are equal (iNai) to the light (Oli) of the sun (kadiravan). While I call out (azhaikka) for you in despair (kadari, manam urugi=with melting heart), are you frolicking (kaLikka) with other (idara) women (mAdar)? Is this right (tagumo, muraiyo)? Is it fair (darumam)? Like your ear-ornaments (kuzhai) lurch (adidum) when you play (Udi) the flute (kuzhal), so too my mind lurches in grief (vedanai). This very nice poem and comment, not to mention the music, which I find very evocative, immediately remained me of what you had taken pains to explain in that note to my review of Kanhaiya (http://www.letstalkaboutbollywood.com/article-kanhaiya-an-oddly-religious-romance-68381438.html), but in that note you had mentioned Meera and Andaal, not Radha: obviously, the poet is referring to the divinity, and Meera and Andaal are historical creatures, right? But what about the similarity of their stories? Hi Yves, Hmm……no we do not see Radha in the same light as Meera and Andaal, and you are absolutely right, it is because Meera and Aandal are from comparatively recent history. Meera and Andaal’s stories may have become embellished in the telling but their poetry has survived – not just survived, but has been loved and sung all these years from the 7th/8th century for Andaal and 16th century for Meera. Andaal and Meera do not have similar life stories, but they both saw themselves as being married to God (Vishnu for Andaal, Krishna for Meera), Meera shunned her husband while Andaal refused marriage, they both are said to have disappeared inside the inner sanctum of temples and they both are considered saints. Meera is not worshipped (too recent?) but Andaal has a place in South Indian temples of Vishnu and is worshipped as His consort. Radha on the other hand was a historical contemporary of Krishna and her story is not at all similar to that of Meera and Andaal. Remember, Krishna is Divine for us Hindus, but we absolutely see him as a historical figure as well. European scholars maintained that Mahabharata was imaginary; Indian scholars, including the venerated 5th century mathematician Aryabhatta, maintained that Mahabharata is history and calculated dates based on astronomical hints from different texts as well accounts in Greek writing. In general Krishna is considered to have lived about 5000 years ago; naturally his story must have been embellished over time but some basic truths must have remained, especially about one who is so revered. Radha is part of the Krishna story, and her love for Krishna was in his incarnated form, not the conceptual love that Meera and Andaal had towards the idols they worshipped. Radha was a milkmaid, a childhood companion and love of Krishna. In fact, Krishna was the love of all the gopikas, the milkmaids, in the community where he grew. I have read accounts of how Radha was older and her love for Krishna was not romantic, but a more motherly or elder-sisterly love but that is a rare opinion. 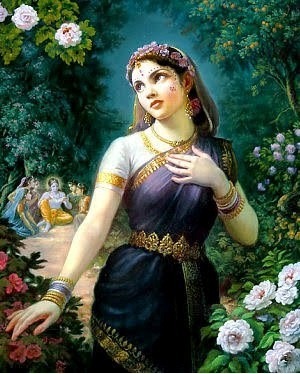 Generally Radha is seen as Krishna’s romance from his young years. What is interesting is that Krishna did not marry Radha; his main queens were Rukmini and Satyabhama but he had others as well, like the kings of those times. In Mahabharata, Radha is a minor character; later stories and traditions (like Gita Govinda) dwelled into the Radha-Krishna relationship. She is worshipped along with Krishna in North India, you will not see many Radha-Krishna temples in the South. The Radha-Krishna love is seen as a symbol of the Human-Divine love in the Bhakti movement. Remembering how Indians love analogy, it is very evident why this is so; that Radha’s love is reciprocated means that God loves us as much as we love Him, Radha has to share her Krishna with others, just as we cannot ask for exclusive attention from God, her life was one of longing for union with God, just as we await the same union. Thanks very much Suja for your detailed answer, which sounds very complete and expert! Hi Meera, I did remember Mani Ratnam’s film and checked out the video. The singer is Harini. Like film songs, it is high pitched but the singing is not too bad. I would have included the clip except the film doesnt use the whole song, only a small part. The audio in Musicindiaonline has the complete song. Beautiful post – loved your exposition of the poem and the raaga. Srinivas’s rendering of the song is brilliant – as you rightly say the high pitch in the film isn’t that appropriate for my tastes. Thanks Ramesh 🙂 I am glad you agree with me about Shrinivas’s rendition – I listened to about 15 performances by different artists before selecting this one, I though he was marvellous. Radha is empodiment of love. It does not end eitherin fulfillment or tragedy.. Like our first crush it refuses to leave our memory. When we first fell in love as a teenager we never attempt to consumate our love. We just long to be in her/his company. Alai Payuthe kanna is my first initation to Carnatic music. I started listening to carnatic Music after i heard Alai Payuthe by Karakurichi Arunachalam live in my native place as a kid. Oh, I like your description of Radha as an embodiment of love! You are right, her life story does not end in fulfillment or in tragedy; its a sweet and gentle love which is special. Hi,Thank you Suja. I was just going thru the lyrics for a better understanding and came across your views on the subject.”Brilliant !” would be an understatement.You have enlightened me with your expert explanation. I am a Kannadiga. (ಕನ್ನಡಿಗ). I can sing dozens of Tamil.Songs. But I am very eager to understand its meaning so that i sing with appropriate feeling. I knew some percentage of Alai Payudae meaning but not with this much accuracy. I am.deeply indebted to you for this excellent presentation. God Blesa You. Welcome to my blog Jagdish! It gives me great pleasure to know that my efforts of translating comes of good use. Thank you for your comment.